Thunder Jet , Queenstown, Otago. Information, Photos and Reviews. Discover Queenstown’s untouched and pristine wilderness during your authentic jet boat journey along the historic Kawarau and Shotover Rivers. Experience the exhilarating adventure of a whole hour of world famous 360° spins, skimming the water at exciting speeds of up to 95kmph, going the furthest distance of 47km, and delightfully complemented by our storytelling commentary. MUSIC ON BOARD - Picture yourself zooming along the water, barely touching the surface with your hair streaming out from behind you. Then, just add music! Tad-Da! You’re in your very own music video. Everybody’s doing it. VALUE FOR MONEY - We have the longest time on the lake for the most economical price. 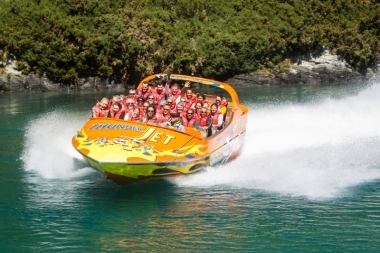 Thunder Jet’s trip is 1 HOUR on the lake and also down the Kawarau or Shotover Rivers! ONE WHOLE HOUR - Your ride lasts a whole hour – GREAT VALUE! Departing right from the heart of Queenstown for your convenience, so you can spend more time on the water with us. ADRENALINE FIX - Of course, a ride on Thunder Jet wouldn’t be complete without those iconic 360° spins! Not to mention travelling at speeds of up to 85kmp/h! EXCLUSIVITY - Thunder Jet’s trip takes you down a section of the Kawarau River that is only accessible by helicopter or jet boat! Experience the luxury of exclusivity on your Thunder Jet journey. Nobody has reviewed Thunder Jet yet, Be the first. You are submitting a booking enquiry. Thunder Jet will then contact you by email with details of availability and prices.